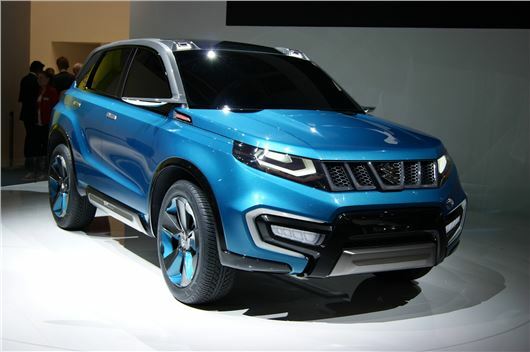 Suzuki has unveiled the new iV-4 concept that will more than likely replace the SX4 and ageing Grand Vitara when it goes into production in 2015. Although Suzuki hasn't revealed too many details about its new baby 4x4, it has said that it will be both lightweight and will be one of the cleanest cars in its class. The iV-4 concept looks near-production ready to us, with the usual provisos about oversized whels and tyres and the usual motor show jewelery. It's actually quite compact, and is sized to compete alongside less overtly off-road rivals such as the Peugeot 2008 and Renault Captur, measuring in at 4215mm in length and 1850mm wide. The styling also shows what the rest of Suzuki's new SUV line-up will look like. The iV4's production counterpart will use the same platform as the recently launched SX4 S-Cross, although it will have a beefier appearance. Four-wheel drive will be available courtesy of its Allgrip system. Both two and four-wheel drive versions are likely to be available with the same 1.6-litre petrol and diesel engines. Despite effectively replacing the SX4, Suzuki says this model will have an all-new name. Meanwhile, Suzuki is also working on replacements for the Alto and the Splash, both to be launched in 2014, as it aims to update its ageing model range.